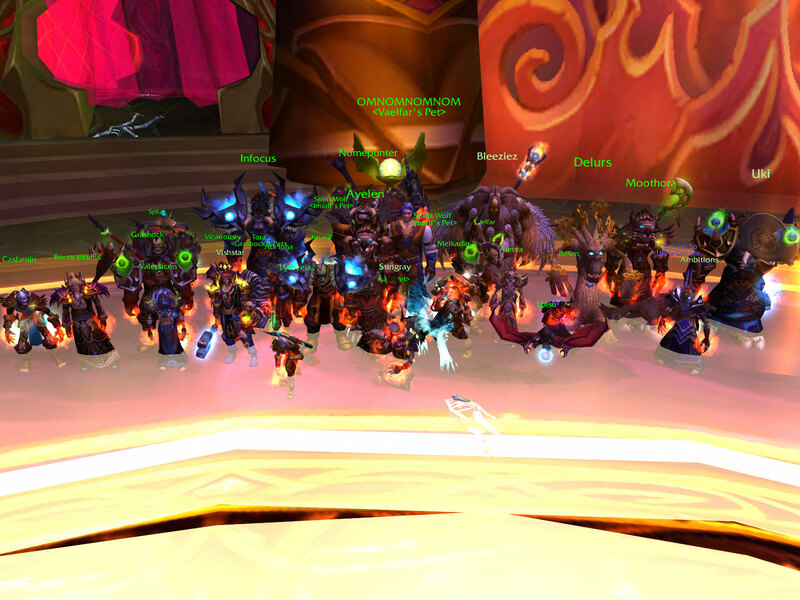 Our first legendary from Kil'jaeden…grats Vaelfar on [Thori'dal, the Stars' Fury]. [Hammer of Sanctification] to Ebisu, [Hand of the Deceiver] to Imaril, [Helm of Uther's Resolve] to Lyrocela, and [Handguards of Defiled Worlds] to Basan. 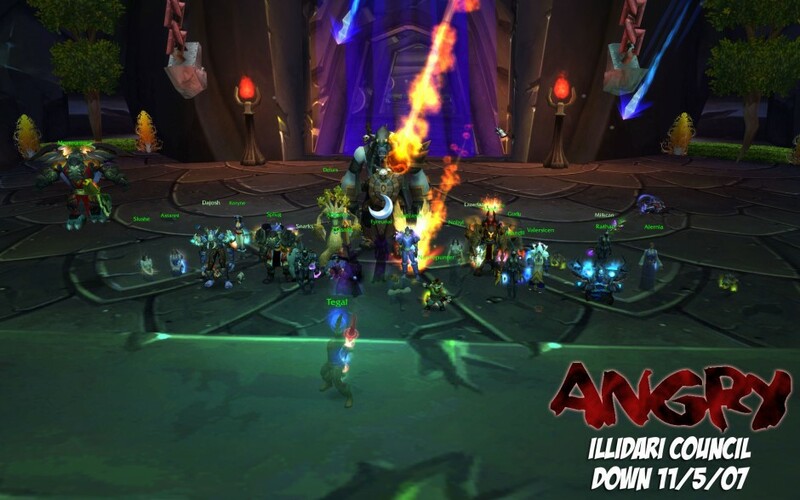 After conquering the retardation, attendance, and disconnect phases of this fight we went and killed a giant floaty thing with a retarded apostrophe and then a big voidwalker with wings, because you can't spell 'epic fight' without 'level 10 warlock summon'. 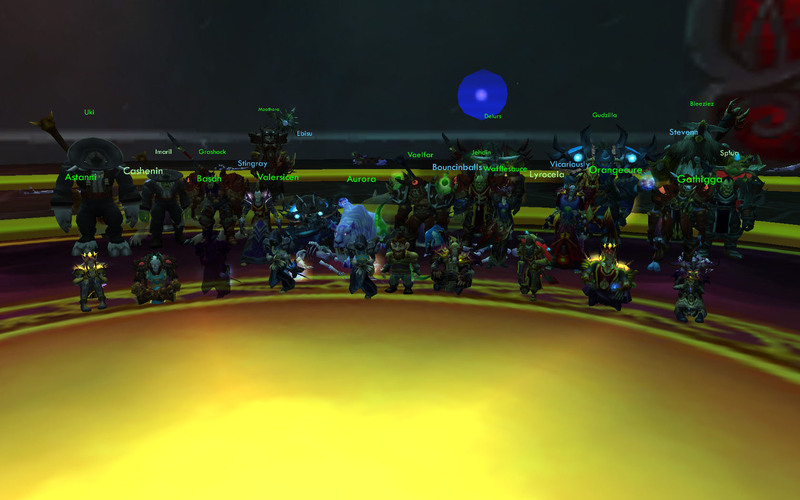 Thanks to everyone who came and slogged through this fight with us, and special thanks to people who'd worked on this boss with us for weeks but weren't present for the kill. Loot was a [Muramasa] to Cashenin, [Glimmering Naaru Sliver] to Gudzilla, [Aegis of Angelic Fortune] to Orangecure, and a [Sin'dorei Band of Triumph] to Nomepunter. It would be easy to make a joke about the similarity between the Twin Eredars and the Twin Emperors. 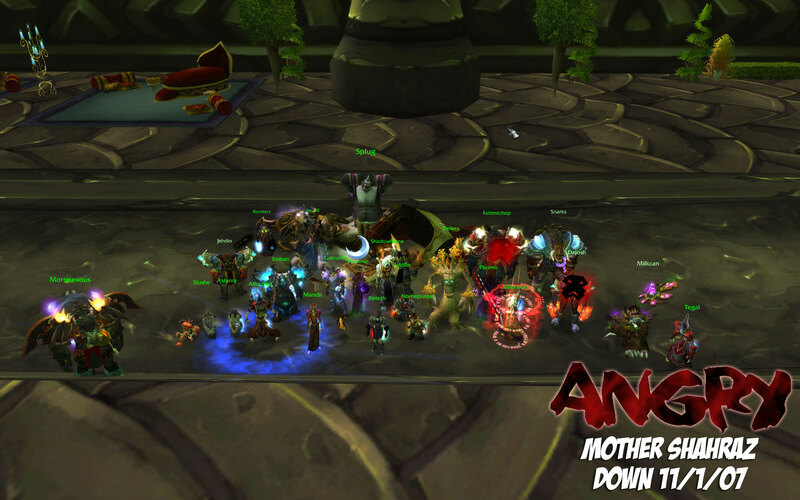 It would even be easy to post a picture of the AQ40 kill and have a good laugh. But will we make those mistakes? No! Because they are lame. Congratulations to Moothora on the [Stanchion of Primal Instinct], Uki on the [Erupting Epaulets], Lyrocela on the [Spaulders of the Thalassian Defender], Tegal on the [Amulet of Unfettered Magics], Nomepunter on the [Onslaught Wristguards] and Wafflesauce on the [Sin'dorei Pendant of Conquest]. Well done to everyone involved, and thank you to all of the old raiders who stuck around through the process of rebuilding when summer hit. PS: Twin Emperedars. It's the only way to go. 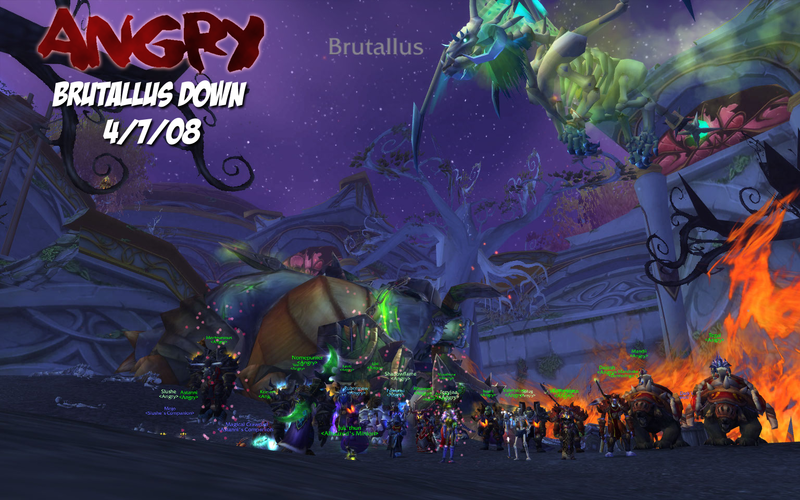 After fighting through trials and tribulations, the pit lord Brutallus has fallen to the <Angry> hordes! Alas, too late to save Madrigosa from a dreadful fate. Splug carried off an [Onslaught Waistguard], with Nomepunter close behind with an [Onslaught Belt]. Wafflesauce walked off with Brutallus' [Leggings of Calamity] and Slushe can't stop crying as he sports his [Lightbringer Belt]. Onward to another Dargon! 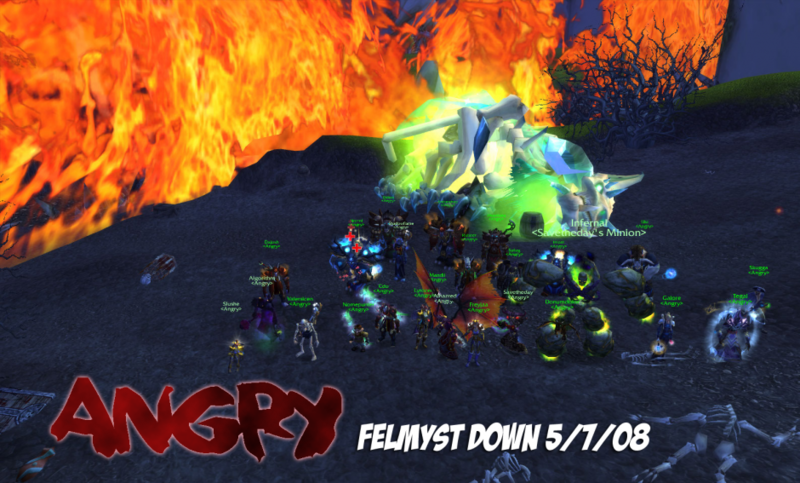 Angry's first forays into Sunwell Plateau proved successful! 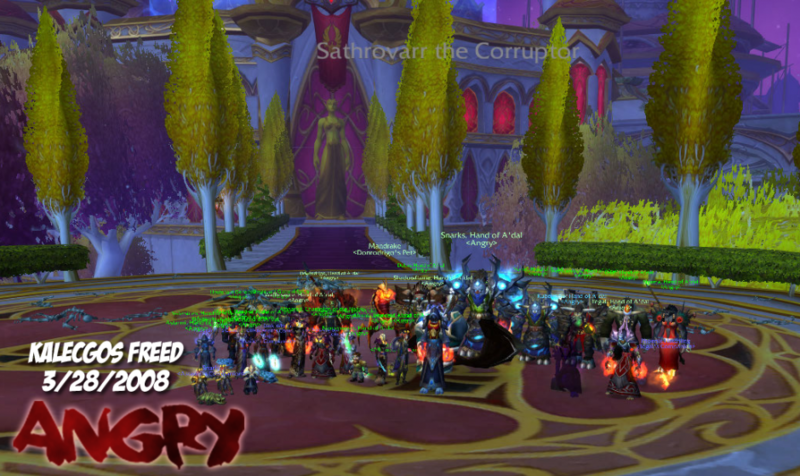 The great Dragon Kalecgos has been freed from the clutches of Kil'jaeden and his Dreadlord: Sathrovarr the Corruptor. Congratulations to Slushe on his [Lightbringer Bracers], Alernia on his [Bracers of the Malefic], and Delurs on his [Breeches of Natural Aggression] and [Thunderheart Bracers]. The Betrayer has become The Betrayed. [Bulwark of Azzinoth] to Splug. [The Skull of Gul'dan] to Alhazred. [Gronnstalker's Chestguard] to Thrush. [Shroud of Absolution] to Fyreunai. 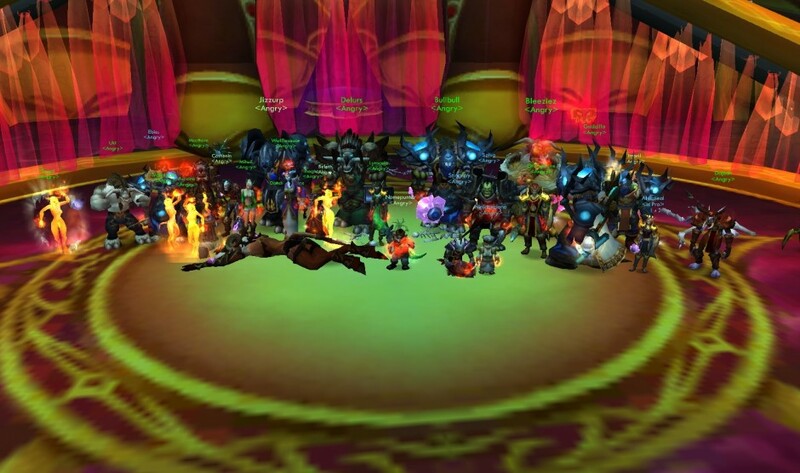 I would like to personally thank everyone that was there to learn the fight and not to finish it, everyone that's been with us since Blackwing Lair, and everyone that stuck with Angry and came to Angry. 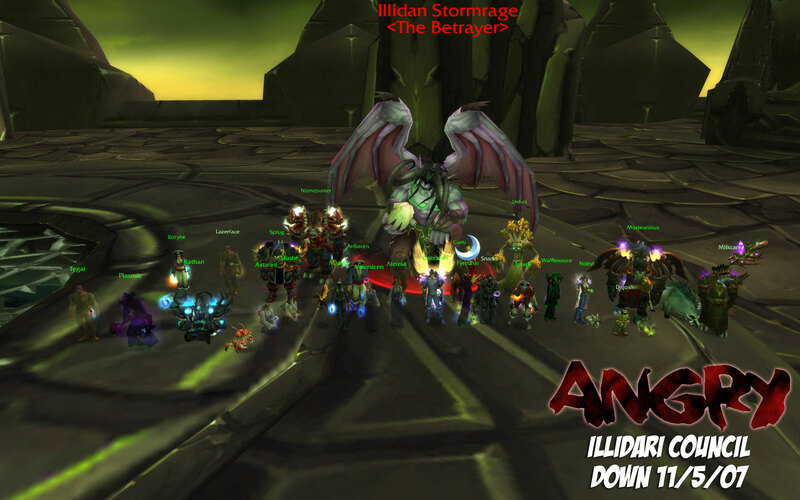 Probably the most intense fight we've seen so far, but with their demise is opened the way to Illidan. Congratulations to Koryne on [Slayer's Legguards], Gabranth on [Lightbringer Leggings], and Thrush on his fifth eye ([Forest Prowler's Helm]). The Shivarra Mistress . . . what can I say . . . oh, I've got it. [Tome of the Lightbringer]. What the HELL is that? And I thought wiping to her sucked, killing her sucked worse. 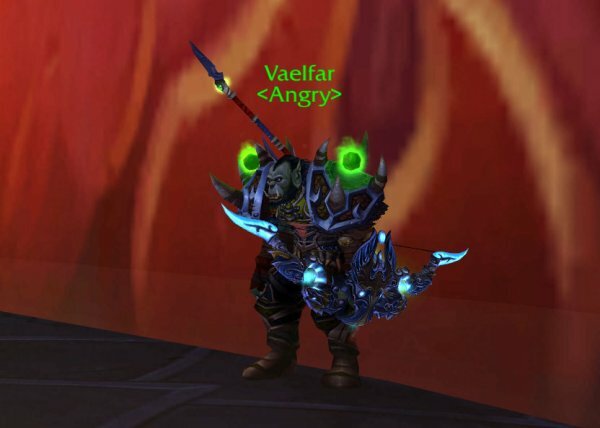 Congratulations to Rylolin on a pair of [Slayer's Shoulderpads] and Splug on a pair of [Onslaught Shoulderguards].